If you are a fitness freak, then you don’t need to be told that your workout sessions need to be boosted up with proper fuel as well. Smoothies are one of the ways to power your body as they help the nutrients get into your body real easy and quick. 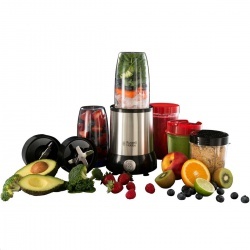 With the SMP060SI Kenwood Smoothie Sport 2Go, you need not spend your precious time getting the smoothie ready. Make sure you're getting the most out of your healthy shakes and smoothies with the 12-Piece NutriBullet 600W Nutrient Extractor Kit. With a 600 Watt motor and purpose-built Extractor Blade, the NutriBullet is able to break down seeds, fruit skins, and stems so you can blend what you like. Three cups - one 700ml tall cup, one 500ml short cup with Handled Comfort Lip Ring and snack-sized handled short cup with Comfort Lip Ring are all included so you can use your NutriBullet Cups on-the-go, mess-free. An included Milling Blade attachment allows you to grind herbs, chop nuts, and mill grains using your NutriBullet. You'll never be short of a healthy idea thanks to the pocket nutritionist guide that gives you handy health info on all your favourite foods. Cyclonic Action in combination with the 600 Watts of power helps extract the nutrition from your ingredients, not letting anything go to waste and maximising your healthy meal. The Fruit Juicer EK1837 by Salter is a delicious and easy way to consume your 5-a-day. 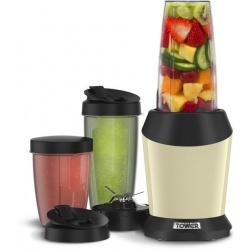 The powerful juicer has a large feeding chute in which whole fruit can be inserted. The fruit then leads into the 2L pulp container, to be juiced using 1 of 2 speed settings for soft or hard fruit. During the process, the juice is funnelled outside into a 1L jug, leaving the pulp in the removable container. Create and discover new fruit blends for the tastiest juice to start your morning. Removable parts are dishwasher safe. Make delicious, nutritious NutriBlast smoothies with the Nutrition Extractor everyone s raving about! The NutriBullet is the phenomenally popular Nutrition Extractor loved by millions around the world! 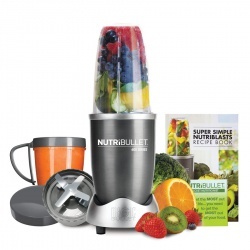 NutriBullet's powerful 600W motor and cyclonic technology creates delicious NutriBlasts by breaking down fruits, vegetables, nuts and even ice through the turbo Extractor Blade. It pulverises stems, seeds and skins where some of the usually neglected essential nutrition lies, providing a fast and easy way to contribute to your Five-a-Day!